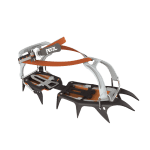 Classic mountaineering crampons with Leverlock Universal or Flexlock bindings, these 12-point steel crampons are ideally suited to everything from Island Peak to Mt Rainier's Kautz Glacier. The Leverlock Universal model works with almost all modern mountaineering boots. If your boot doesn't have a heel or toe welt, go for the Flexlock instead. 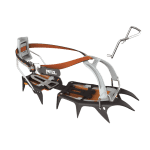 Learn even more about fitting crampons here.